I cooked some Curry Butternut Soup and the reviews are in. Monday – Ariel – “Squash Soup is Yummy”. Tuesday – Will – “More Squash Soup”. Wednesday – Will – “Squash Soup today?”. Thursday – Mom – “If you both go to the potty like big kids you can have Squash Soup” Kids – “OK”. 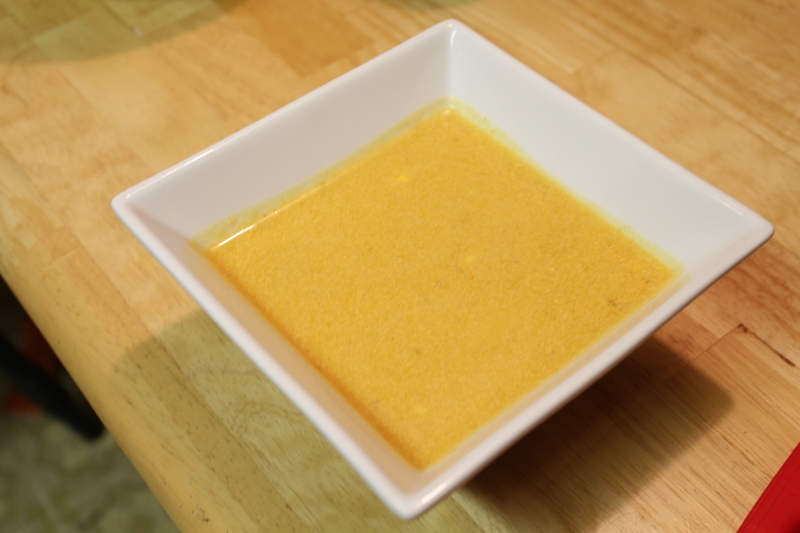 What I am trying to say is that the kids loved the Curry Butternut Soup. This recipe comes from an excellent restaurant at the Animal Kingdom Lodge called Boma. Boma primarily serves African Cuisine, to go with the theme of the lodge. Catherine and I went to this restaurant on our honeymoon and were delighted by this buffet. The only problem was the fact that there were so many different items, we stuffed ourselves trying everything. Unfortunately, we haven’t been back to this restaurant since our honeymoon because the Animal Kingdom Lodge is not conveniently located. You have to go to a park and transfer buses to get there. The bus ride tends to be one of the longest and it’s asking a lot to drag us from the mouse for that long. Anyway, back to the Soup. 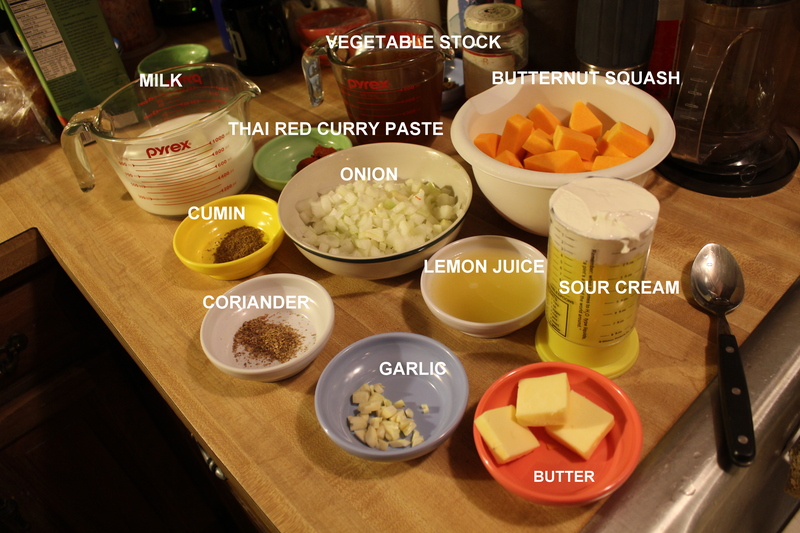 I figured out how to put text into my pictures so I present to you, labeled ingredients (Hooray for me!). Despite the African origins of this meal, there are not many ingredients that are difficult to find. The Red Curry paste may be a little tricky for some to find, but that’s what the internet is for (my local Wegmans had it). You cook this dish all in one pot. Start by sautéing the onions and garlic in butter. After about 5 minutes, add the cumin, coriander, curry paste and lemon juice. Mix it up and add the veggie stock and squash. 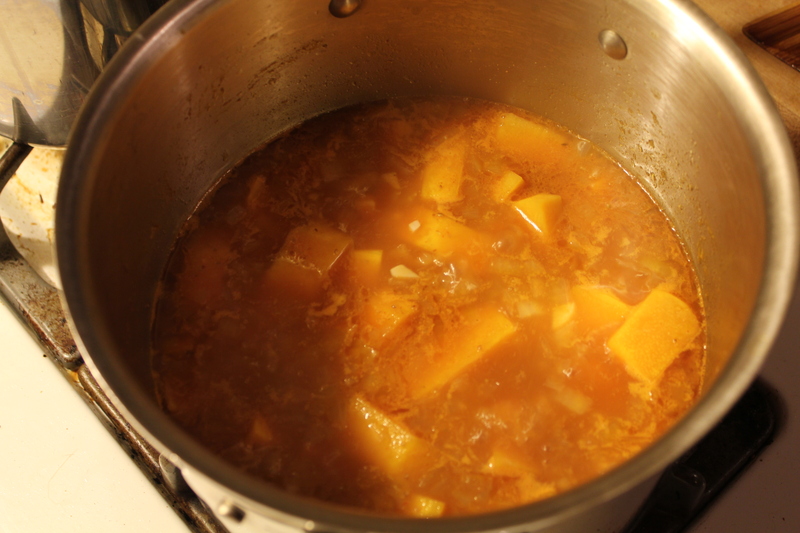 You have to simmer the squash under rather tender. We are holding off on the dairy because, simply, it’s way too delicate to take your eyes off. I wouldn’t want to stare at a simmering pot for 20 to 30 minutes, would you? If you got distracted, you could have boilovers, scorching and a complete breakdown of the dairy product. Once the squash is nice and tender, it is time to blend. You can use a regular blender or a stick blender. I found out the hard way that when the recipe says blend in batches, you should blend in batches. I didn’t and the soup had very small bits of squash in it. It would have taken a long time to blend the whole batches together and I stopped too early. The wife kids are not very patient for perfection; maybe in twenty years. I hypothesize that the soup will be smoother if I blend it in small batches next time. At least now I have a reason to make this recipe again! Once the squash is sufficiently blended, return to heat and add the milk (whole or 2% please, it’s not going to kill you) and sour cream. Stir it in and you are good to go. You could garnish with Cilantro but I didn’t because Cilantro tastes like dish soap to Catherine (Fun Fact: This is an actual genetic thing that a significant portion of the human population suffers from….and they don’t know how much worse off their life is without cilantro. I pity them.) Don’t be too slow to get this to the table, it could separate. I liked the flavor of this soup, some spice, not overbearing, good squash flavor. Obviously, the kids love as they keep asking for it as if we have an endless supply of “Squash Soup”. It’s also pretty good in regards to healthiness. Have some soup, a nice salad, some crusty bread and you have a healthy meal with an international flair.